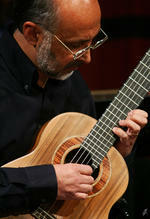 Richard Charlton is widely recognised as one of Australia's leading guitarist/composers. Born in the UK in 1955 he has lived in Australia since his parents emigrated in 1962. Largely self-taught, he initially started writing music to expand his own repertoire, but now his works have been performed and recorded by many leading Australian and international players and feature on more than 30 CDs. Richard's music combines a love of melody with a keen sense of harmonic and formal structure - music 'to entice the ear as well as the intellect' (Fred Blanks - Northern Herald). In 2004 Richard was awarded Instrumental Work of the Year at the APRA/AMC Classical Music Awards for his quartet Stoneworks, commissioned by Saffire. In March 2005 the UK magazine Classical Guitar described him as 'producing some of the most inspired and accessible guitar works of the present era'. Richard Charlton has been a featured composer at the Darwin International Guitar Festival, and was invited to be part of the adjudication panel for all the Darwin Guitar Competitions. He was also on the adjudication panel for the 1st and 3rd Australian Guitar Competitions in Newcastle and, more recently, the Adelaide International Guitar Festival Competitions. In 2001 one of his works was featured on an ABC TV documentary about the Terrace Proms in Perth. Richard has also had works premiered at many major festivals worldwide, including the Adelaide Festival, the Radio France International Guitar Week in Paris, the Sonorities Festival in Belfast and at Australia House and Bolivar Hall in London. In 2004 part of his concerto, Rhapsody for guitar duo and guitar orchestra, was included a live radio broadcast from the Concertgebouw in Amsterdam. Richard Charlton has lectured on composition at the Guildhall School of Music and Drama in London and at the Elder Conservatorium in Adelaide. He has also taught in masterclasses at the Royal College of Music in London and given chamber music classes for the students of Prof. Maria Isabel Siewers at the Mozarteum University in Salzburg. Many of his pieces for students are currently in the Australian Music Examination Board Syllabus. He has also contributed pieces to the student series Modern Times, published by Chanterelle, and to the Ben Verdery Guitar Series published by Frederick Harris Music in Canada. As former Director of Music Performance at Ascham School for many years, Richard has been involved with the creation of many new works for student orchestras and vocal ensembles. As a conductor and educator he has worked with all kinds of age groups from kindergarten to mature age, and has conducted a wide variety of orchestras ranging from 80-piece student guitar ensembles to school choirs and full symphony orchestras such as the St. Istvan Music School Orchestra (Budapest) and the SBS Youth Orchestra (Sydney). Highly sought after as teacher, composer and pedagogue, Richard has worked with children all over the world, conducting workshops at schools as diverse as Perth Modern (WA), Northlands High School (Buenos Aires), the Centre for Youth Music (Darwin NT), St. Paul's' Girls School (London), Associazione Musicale di Varese (Italy), the Instituto Universitario Nacional del Arte (Buenos Aires, Argentina) and at Enkhuizen in the Netherlands. - Program note: Richard Charlton's "Four Australian folk songs"
- Program note: Richard Charlton's "Nightsongs"
- Program note: Roland Charlton's "Rainsong"